Savvas Savva was born on 23/02/1977 in Limassol. Since the age of 8, he had been participating in swimming competitions with the Limassol Nautical Club, finishing top ranked in many national freestyle and backstroke competitions. While growing up he becomes passionate about underwater swimming and in 1995 he becomes one of the founding members of OFEK where he he is part of the board of directors. Until 2000 he participated in national spear gun fishing competitions. In 1999 he qualifies as a "Decompression Techniques" diver at Technical Diving International. 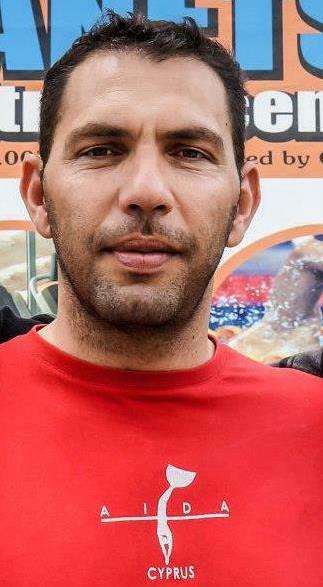 Since 2003 Savvas competes in local and international freediving competitions. In 2004 he placed 11th during the world singles championship while competing against 187 competitors, and up to 2005 was the holder of 4 national records in static and dynamic apnea and fixed weights. In 2004 he graduates from the Greek Federation of Underwater Activities (CMAS) in Athens and began teaching free diving in Cyprus. In 2005, along with Michael Tsirponouris and Vassilis Zonomesis, they present the movie "Στο μπλε ποτέ δεν είσαι μόνος" (In the blue sea you are never alone) which is mainly about the capture of sea prey as tuna and mackerel. In 2006 AIDA is established in Cyprus. Savvas' gets elected as a member of the Board of Directors and actively contributes to the organization of freediving competitions as well as informational seminars. During the same year he participated in the world team championship for freediviging at Hurgada, Egypt where he also attends a seminar on becoming a competition judge from AIDA International. In 2007 he oversees the AIDA Instructor Course school in Crete. In January 2008 along with fellow instructors Panicos Panagiotou and Nicolas Nicolaou they submit a completed diving instructors system for free diving (ΚΕΣΕΚ) to the Cyprus Federation of Underwater Activities (ΚΟΥΔ) where they are recognised as CMAS instructors thus making the sport and its teaching officially recognised in Cyprus. Aiming at an education of high standards on the subjects of safety and the right technique of freediving as well as theoretical knowhow, Savva provides courses certified by AIDA International and CMAS Levels 1-3 in all Cyprus cities and in Greece though cooperation with the BLUE TEC training team.